Florian Cafe: The Dinosaurs Hatch Tonight! I'm higher than five elephants. I'm longer than most whales. A tail that is my weapon. It swings from side to side. Het kid, ya wanna ride? If I've promosed you the book it will be coming soon. I received my author's copies a few days ago. I'm available for interviews and the book is available at amazon.com. My iguanodon is not available, and I have to go take him for a walk now. Let me be the first to congratulate you on a brilliant book. Your're a quick Kat! Thanks!!! Well, I feel very honored, b/c my copy was hand-delivered by the UPS man at the end of last week! This young hatchling has that wonderful new book smell, is loaded with my kind of silliness and so typically wonderful Florian illustrations But! My fave...is Spiny's "underwear of flannel." What fun! Congratulations! Congrats, Douglas! 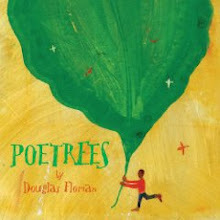 I preordered two copies: one for my son and one for a giveaway on my blog this week! Thanks Kat, Nanny, raffy, gael, Kelly, and Teresa. Red flannel underwear to come. Wowsie! Are you handing out cigars? Congrats! OMG: I saw you popped by my blog and came over to say thanks and took a peek at your profile - I can't believe my Word for Wednesday was going to be entropy - still pondering it...but I might have to work a little harder. kim: I was going to bring my entropy but it broke. 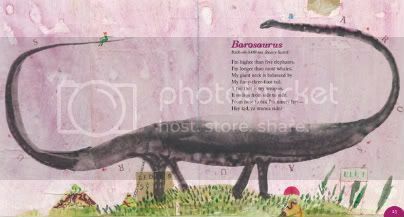 jama: just be careful the dinos don't dine on you! 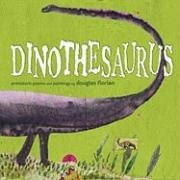 I have already received the two copies of DINOTHESAURUS that I ordered quite some time ago. 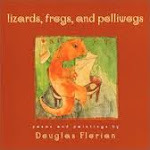 Another great poetry collection from a master of light verse for kids! thanks for your support, Elaine! Congratulations!!! Very exciting. Looks like a book my son will absolutely love! Ooh, what's the dinosaur's yummiest treat? For us little humans, this book will be delicious and fun to read as well! Congratulations and thanks for sharing so much of it ahead of time - it makes the anticipation even sweeter. Yay--congratulations, Douglas! And, yes, I DO wanna ride. I saw this in Beach Lane Books' brochure at an event a couple of weeks ago, by the way. Not sure I realized that's who it was with until then. Can't wait to read the whole thing. These sneak peeks have been tantalizing! P.S. "Misleading" underwear - now that is an accomplishment! I preordered months ago and am excited to read, relish and rejoice in your wondrous words and pictures. Thanks to Kelly H-Y, Mary Ann, Laura, and especially Julie and Jill for tipping me off to the Times review. A nice surprise!